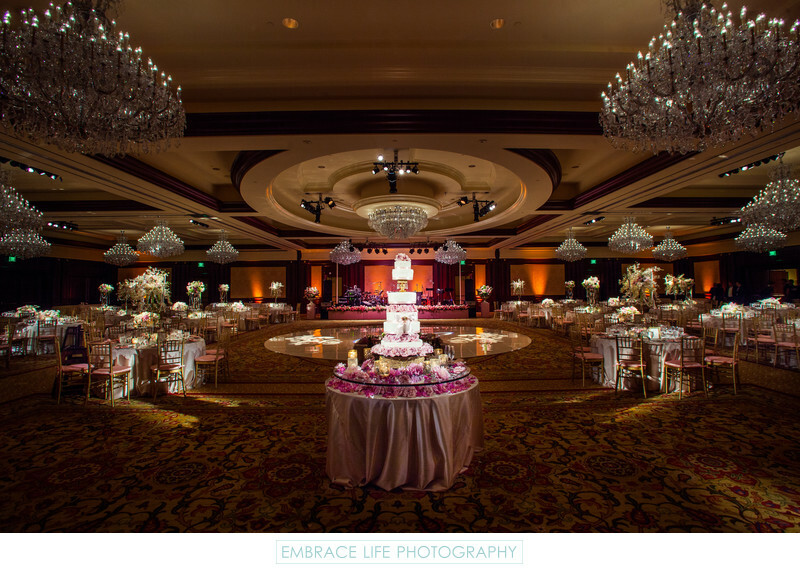 Four Seasons Westlake Village wedding reception, designed by Laurel & Party, in the grand ballroom with the six-tier wedding cake on a glass table top floating above a bed of pink flowers on display, front-and-center. The many crystal chandeliers, pin spots, uplights, dance floor cookie and monogram lighting, tall floral centerpieces by Brad Austin Imaginative Florals and gold chiavari chairs with pink cushions provided an incredibly elegant atmosphere for wedding guests to enjoy throughout the night. Location: 2 Dole Dr, Westlake Village, CA 91362.